The publisher got around to sending me my contributor’s copy of The Book of Swords, nearly four months after the rest of you had probably got yours. I’ve been reading it, and after I noticed how damn good an anthology it was, with a double helping of very talented authors like Ken Liu and CJ Cherryh and Scott Lynch and Elizabeth Bear and Daniel Abraham and George RR Martin, I noticed something else, which was that many of the stories had certain commonalities. Which tells you a certain way in which authors think. I went back and read my invitation from Gardner Dozois to contribute to the anthology, and found that the invite asked me to write a high fantasy story, with, y’know, a lot of fantasy stuff. I presume other authors got the same sort of invitation, if not the exact same one. So the first thing I noticed was that while the invitation was to write high or epic fantasy, most of the writers didn’t do that. They defaulted instead to sword and sorcery. Introduce your protagonist and swat him with a fistful of trouble. Protagonist encounters an obstacle and defeats it. Protagonist encounters another obstacle and defeats it. Another obstacle, another victory for the hero. Now the obstacles can all be different, and colorful in different ways, and require different sorts of skills to defeat. You can have giants, evil wizards, illusions, puzzles, fabulous beasts, or the Sphinx with its riddle. But the point is that you can keep them coming until you near the end of the story, and then you have the climax and its finish. If you’ve got 10,000 words to write and a limited time to write them, this form is easier than any other. If completing the story is an obstacle that you’ve got to defeat, then employing certain authorial cantrips makes the victory less strenuous. Now I should point out that the stories in this anthology are sufficiently varied that you probably wouldn’t notice the similarity in structure (unless someone like me points it out). The protagonists are different, the obstacles are imaginative and widely varied, and the authors are all highly skilled at what they do. They didn’t all write the same story. They used the same tool to write it. And another thing I noticed: the vast majority of protagonists in these stories are thieves. Running an eye down the table of contents, I’m guessing at least ten of them. That makes Step 1, above, easier, because it puts the character in a situation right away. 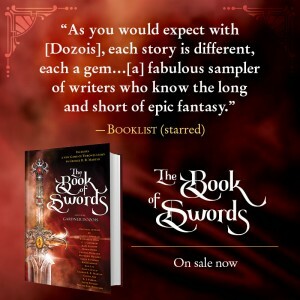 And of course the title of the anthology is The Book of Swords, so that answers the question. Or, alternatively, the thief is the one who has the sword. And if neither is the case, a thief in a fantasy world is likely to encounter a sword somewhere along his route. Thieves in fantasy tend to be a lot more charming than the guy who kicked in your front door and ran off with your TV set, so very often you’re on the thief’s side right away. And if the protagonist isn’t a thief, maybe he’s an assassin. Assassins, too, can be charming in fantasy— and if not charming, at least they can have very good reasons for what they do. Once again, I want to point out that the authors didn’t at all write the same story. They may have decided to write about thieves and assassins, but the thieves themselves are different, their motivations are different, their quests are different, and that’s because the authors are different. Some stories were funny, some ironic, some violent, some thoughtful, some tragic or sad. Sometimes authors employ the same sets of tools to do what they do. And if you want to be an author, you want to use all the tools available. So you might want to consider attending Taos Toolbox. Because that name isn’t an accident. 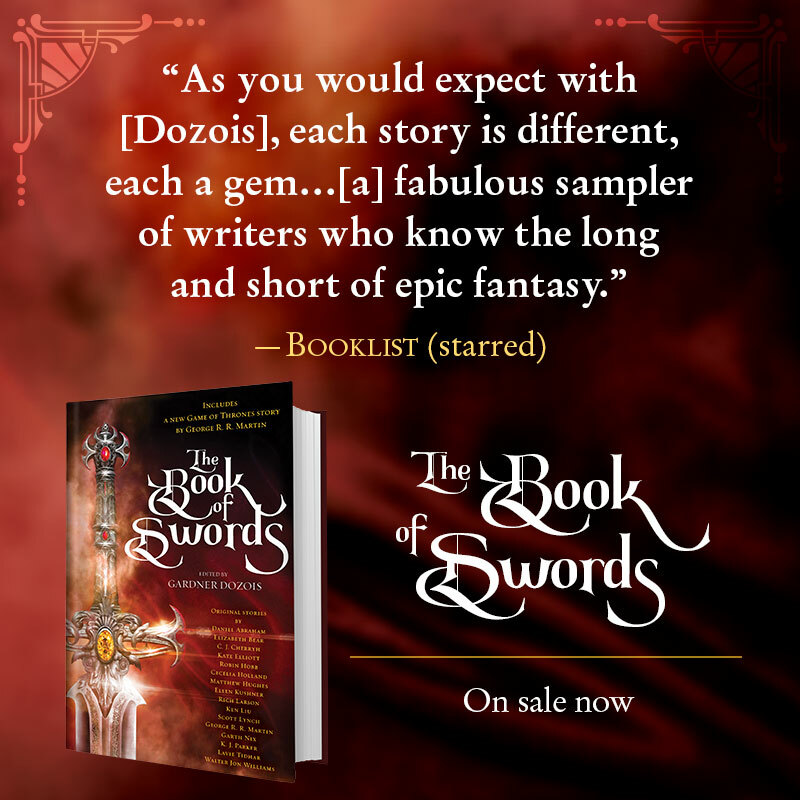 That does sound like sword and sorcery to me, not high fantasy, which wasn’t mentioned. Maybe he asked different authors for different kinds of stories — which makes sense, I guess, if you want to have some variety. He knows I do Jack Vance-influenced picaresques and woldn’t know high fantasy from a highball. But I agree with your view: if you’re writing picaresque fiction, it’s basically one damned thing after another, with desperation only a sword’s stroke away. I wouldn’t want to be a character in one of my stories. They often don’t do well. C’è il concreto sospetto che, a parte i libri della serie Sorcery e i due extra di Steve Jackson, sia l’Allansia il cuore di tutte le avventure della serie e su una certa coerenza di questo continente meraviglioso si baseranno le prossime uscite. Se quanto detto fosse corretto, seguitemi in questo volo pindarico, i prossimi titoli Scholastic potrebbero essere altri due volumi di Sorcery e Starship Traveller (Steve Jackson) e altri tre classici ambientati in Allansia di Ian Livingstone, da pescare tra i seguenti: Caverns of the Snow Witch, Temple of Terror, Trial of Champions e Crypt of the Sorcerer. There is the concrete suspicion that, apart from the Sorcery series books and the two extras of Steve Jackson, both the Allansia the heart of all the series’ adventures and on a certain coherence of this marvelous continent the next releases will be based. If what was said was correct, follow me on this Pindaric flight, the next Scholastic titles could be two more volumes of Sorcery and Starship Traveler (Steve Jackson) and three other classics set in Ian Livingstone’s Allansia, to be fished among the following: Caverns of the Snow Witch, Temple of Terror, Trial of Champions and Crypt of the Sorcerer.